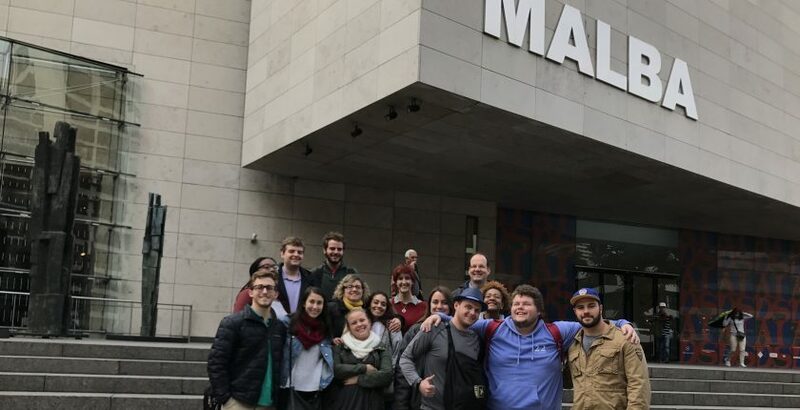 This week the students visited MALBA, Museo de Arte Latinoamericano de Buenos Aires, to discover the artistic wonders of Latin American. MALBA was created by Educardo Constantini and is owned and operated by the Constantini family foundation. They opened the museum in 2001 as a gift to the city to share and showcase their extraordinary art collection. Over the years, they have added many more exhibits and Latin American works. More than one million people visit the museum each year. MALBA focuses on displaying art from the 20th century until the present and aims to educate the public on modern art. The museum has a lot of diversity and is known for its abstract and unapologetic exhibits. Visitors can also watch educational and artistic films at the museum. One of the main attractions right now is the exhibit of General Idea Broken Time curated by Agustín Pérez Rubio. It sends a powerful yet elusive message to the public and was one of the first works to address AIDS, which two of the original artists had died from in 1994. Another exhibit currently housed in the museum is Verboamerica, curated by Andrea Giunta and Agustín Pérez Rubio. The exhibit portrays images of Latin American history through experiences and actions. It contains a total of 170 pieces of art.